Over at Rainbow Beach the other day as I was driving down to the beach I passed some birds on a front lawn right next to the road. I backed up in the car, put it into 'park' and left the engine running. Then I rolled down the window and leaned over and started taking photos. The birds were not at all worried about a car right next to them and I was just pleased to get this close to Brush Wattlebirds. Previously I had only seen them high in the trees and in fairly deep shade. 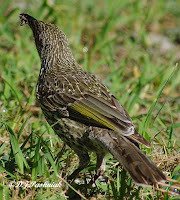 Clicking on the image to enlarge it will show the beak-full of food the bird had! I don't know what made this lawn such a good place to collect insects and grubs but the birds stayed there hopping around on the lawn and up into the low branches of the grevillea . 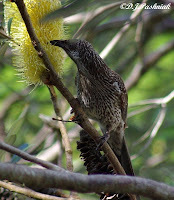 btw I use Slater's Field Guide to Australian Birds (2004,2005) but I am now told that more recent birding books are now calling these birds Little Wattlebirds. Maybe its time to buy a newer bird book! This morning was a perfect day. Definitely too nice to stay inside - especially as I have spent the last week shivering and aching with the flu and hardly daring to poke my nose out the back door! I drove over to Rainbow Beach to see what the last lot of rough weather has done to the beach. Most of the walking tracks down to the water are closed as the drop-off down the sand banks is just too steep. The Surf Live Saving Tower is now perched up on its stilts and not too much else! The rocks south make this part of the beach impassable to all traffic. The sea was calm this morning although the water is still discolored quite a way out. There are always a few surfers sitting out on their boards and waiting for a wave. The view south towards Double Island Point shows the cliffs of colored sand that give this place its name. Right of center in this photo the sand cliff rises to Carlo Sand Blow. The Sand Blow is a place where the sand has moved back from the cliff and now pushes back over the hill and down into the valley on the other side. It is visible even from the other side of the Bay. There is a well-made walking track along the ridge above the town and up to the top of the Sand Blow. The views out toward Double Island Point are great. There were crows calling and soaring up there this morning. Facing the other way you can see right across to Tin Can Bay. The land in between is part of the Great Sandy National Park. A Sulphur-crested Cockatoo flies high above the bush. Further south and towards the southern end of the bay is Cooloola Cove. Over the last few weeks I have been seeing these birds in the grevillia bushes. 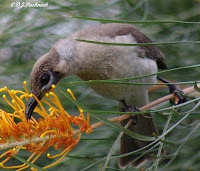 They are honeyeaters and there are always a few flowers open on the grevillia. Other honeyeaters - including the Noisy Friarbirds - stay around my yard all year but the Little Friarbirds are here infrequently. 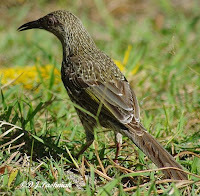 I was walking along the bush track at Inskip Point yesterday when a bird flew out of the bushes beside me. It was just a flash of blue/green as it passed me but then it flew down on to a low branch a few meters ahead. I quickly lifted the camera and tried to get a good focus in the very deep shade that the bird had perched in. I was able to get a few steps closer before it disappeared into the thick bush. 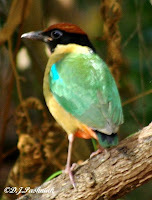 This was a new bird for me - a Noisy Pitta. Getting a photo was a bonus! For more bird photos visit Bird Photography Weekly. Even though most of the shorebirds have migrated there were still a few around - both juveniles that will migrate next year and locals that stay here all year. Bar-tailed Godwits were standing in the shallow water and Red-capped Plovers and Red-necked Stint were busily hunting for food across the exposed sand. The birds were reflected in the sea and each little puddle. A Little Egret hunted fish in the shallow water and then flew off when I got closer. Pied Oystercatchers let me get quite close before they too flew off. Nothing is perfect! The mosquitoes were terrible and I hadn't put on enough insect repellent to keep them away! I went for a short walk out at the Seary's Creek picnic area the other day. Seary's Creek crosses the road to Rainbow Beach and then flows down at least another 5 or 6 kilometers before it reaches the salt water of the bay. There is a short board walk from the parking place down to the creek. The walk beside the creek is quite close to the road and its easy to hear vehicles going by. However, the bush is so thick that it feels very secluded. Add to that the sound of running water and birds in the trees and bushes and its a beautiful place to relax for a while. The birds were out of sight the other day. It's only when the bushes close to the walk are flowering that they are easy to see. It's always still down by the creek and the water reflects all the vegetation. It's not a big creek although there are several pools which are more than waist deep and very cold. There is quite a large volume of water coming down all the time. The source of the water is a spring further up in the Great Sandy National Park. The water in the creek is very clear and you can see the exposed roots of bushes and trees beside it. The color of the water is fascinating. It is usually described as "tea colored" and is caused by the vegetation that it flows through. However, with the sun on the water the color varies from pale orange to deep red - Beautiful! 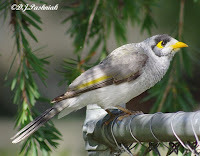 Noisy Miners (Manorina melanocephala) are one of the most common honeyeaters along the east of Australia. As the name suggests they are noisy and inquisitive. 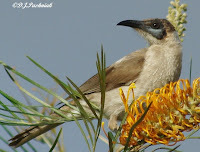 They often live in colonies and can be quite aggressive to other birds. I have had them sit just out of reach and scold me until I left what they considered to be their territory. Strangely, I have not seen any close to where I live right now. These photos were taken up at Esk. The car park at Inskip Point was almost empty yesterday. Immediately behind where this photo was taken, the sealed road becomes a sand track out to the end of the Point. A number of walking tracks lead off into the bush beside the road. Each track is set back behind wooden posts so that vehicles can't use these other tracks. The bush is quite dense and is a mixture of quite high trees and lower growing shrubs. Yesterday the wattles (acacia) were only just coming in to bloom but the banskias were in full flower. I heard Rainbow Lorikeet, Noisy Friarbirds, Brush Wattlebirds and Blue-faced Honeyeaters up in the tops of the trees. They were making so much noise that it was hard to hear any of the smaller birds. Even down at the level of the track the brush is so thick that it is hard to get clear views of any birds. 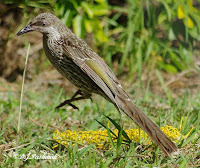 This Brush Wattlebird showed itself clearly for a few seconds. This Blue-faced Honeyeater remained partly hidden. At the end of the Point the tides have been cutting into the banks and a number of trees have recently fallen. Fishing at the end of the Point. Silver Gulls are always somewhere around when there are people fishing. The channel between Fraser Island and Inskip Point. I am told that the channel is quite deep but the deepest part is quite narrow and constantly changing. Even experienced boat skippers watch their depth sounders carefully.